EDGE SE847 SSDs are TAA compliant, built with premium controllers, and backed by a superior five-year warranty. Exclusive to CDW, the SE847 series stands at the center of quality, performance, and value. Leveraging over 30 years of industry experience, it is engineered and manufactured for the over 250,000 customers of a leading provider of integrated information technology solutions. Featuring a Silicon Motion controller and quality 3D MLC NAND*, SE847 SSDs are loaded with enhancements to promote a high performing and reliable computing environment. TRIM, Wear Leveling, StaticDataRefresh, and ECC functions optimize data processing efficiency. S.M.A.R.T. and a built-in temperature sensor assist with monitoring drive health. The SE847 provides outstanding transfer speeds. Improved system startup, data access, application loading, and backup times are typically realized when upgrading systems from a traditional spinning disk hard drive to an SE847 SSD. External DRAM is included to further enhance read/write and IOPS ratings. 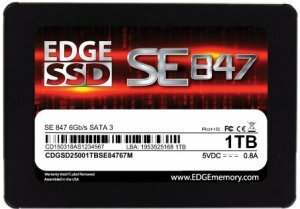 The EDGE SE847 is exclusively available at CDW. If you need assistance, please call us at (800) 259-8989.